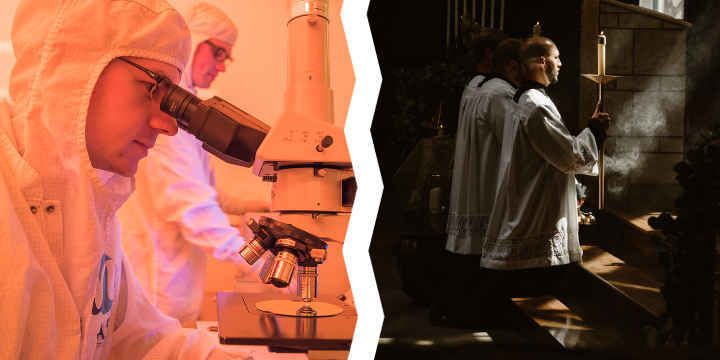 Is there a conflict between science and religion? Do religious people and scientists think in different ways? In the next few posts I’m going examine the perceived conflict between science and religion. First, a quick look at some statistics of who believes and who doesn’t. You can read people saying that few scientists believe in God, and this is showing the way of the future. And so, they say, religion will gradually die out, in advanced countries at least. What is the evidence? Less than half scientists believed in God or a higher power, while almost double that percentage of the general population did. A similar percentage of scientists disbelieved (the remaining 20% or so were not committed to either view) whereas unbelief in the general population was very low. The percentages among scientists hadn’t changed significantly in a century; however disbelief was and is growing among the wider population. Among elite scientists, the percentage of believers dropped to maybe one in ten. These figures were based on US studies a decade or more old now. So what is the situation worldwide, more recently? Several studies conducted by Prof Elaine Howard Ecklund in the past few years have provided new insights, and the most recent study includes data from eight countries. Countries were chosen to represent a variety of religious cultures, highly secular (France, UK), majority christian (USA) and other religions (India, Turkey). But overall, little had changed. Belief in God or a higher power among the scientists surveyed varied from about 20% in the UK to more than 50% in India, Italy, Taiwan and Turkey. But the remaining scientists are not all atheists. The majority of non-religious scientists were fairly agnostic about God. Only in France did the number of atheists reach 50%, while the lowest percentage of atheist scientists was 6% in Turkey. In the US, the percentage of scientists who believe in God is around 40%-50%, with a further 20% describing themselves as “spiritual”. In six of the locations surveyed, scientists tended to be less religious than the general population, but in Taiwan and Hong Kong, it was the other way around. And while we might think that the US is a strongly christian country, the surveys found that only 20% of Americans attend church weekly, compared to 18% of the scientists surveyed, not a large difference. It seems that many people in the US who identify as “christian” don’t attend church regularly, while most scientists who identify as christian apparently do attend regularly. In all eight locations, only a minority of scientists believe that science and religion are in conflict, and a significant minority think the two can support each other. The general population in most of the locations felt much the same. You might expect religious people in the US to think science is a threat to their religion, but this isn’t the case. Around a quarter feel science is a threat, but the majority think science and religion are not in conflict. It is easy to build our views on stereotypes and exaggerations. While scientists are generally less religious than the wider population, the idea that religion and science are opposed appears to be based on minority views. But do scientists think differently, and more logically, than religious people? That’s for my next post.